In Osage County, the Water Sports Capital of Kansas, few would disagree that Pomona Lake is a jewel among the two federal lakes and a state fishing lake that give this water playground its title. Pomona Lake celebrated its 50th anniversary in 2014, having been dedicated on Sept. 5, 1964, when the lake was opened to begin control of flooding of 110-mile, Dragoon, Plummer and Valley Brook creeks, and the downstream Marais des Cygnes River. Area residents, businesses, friends, Pomona State Park, and the U.S. Army Corps of Engineers invite everyone to take a look at all the lake still has to offer after 50 years of operation. 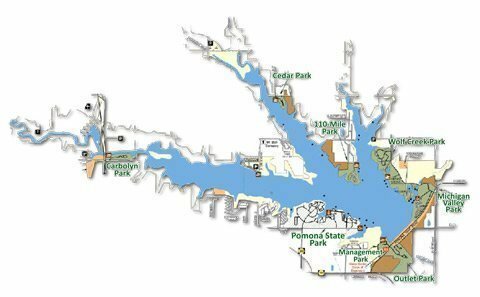 Every year, as spring arrives and the crappie start biting, and Osage County’s local hospitality offers a warm welcome to all who come to enjoy Pomona Lake’s abundant recreational opportunities. 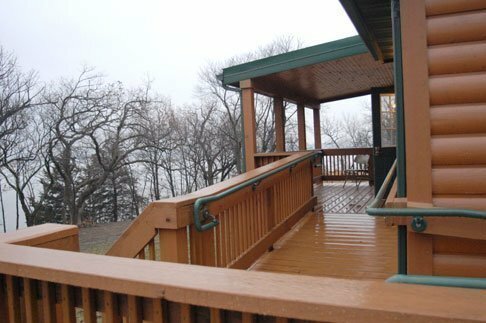 The lake is widely known for its fishing opportunities for crappie, walleye, bass and catfish, and shady and quiet campgrounds along its shores in nine parks. The eight parks managed by the U.S. Army Corps of Engineers and the 490-acre Pomona State Park are favored by northeast Kansas residents for their great family atmosphere and easy access to the water, whether skiing, boating, fishing, or swimming. Pomona Lake has 4,000 surface acres and 52 miles of scenic shoreline and offers many other activities including camping, hunting, hiking, horseback riding trails, and two disk golf courses. Pomona Lake is also within easy driving of two other Osage County fishing hotspots: crappie-lovers’ Melvern Lake, and Osage County Fishing Lake, known for its bass and walleye fishing. Two marinas are on Pomona Lake: North Shore Marina, at Michigan Valley Park, and Lighthouse Bay Marina, at Pomona Lake State Park. Both provide a variety of services including fuel, slip rentals, boat repair, snacks, fishing supplies and bait. 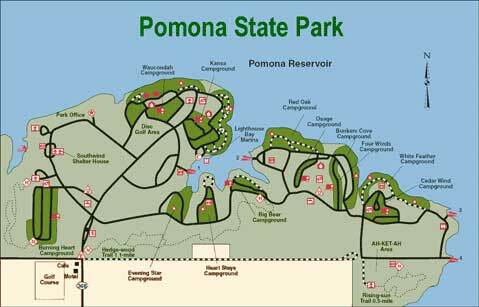 Pomona State Park is located near Vassar in Osage County (about 30 miles south of Topeka). In addition to prime Kansas fishing, recreation opportunities at the park include great camping and picnicking, boating and water access, and hiking and wildlife viewing. The park always has plenty of campsites – 142 water and electric campsites and more than 200 primitive campsites, but campers should remember holiday weekends can fill the campgrounds. Four boat ramps make it easy to put your boat on the lake, and the generally calm waters are popular with skiers and jet skis. Southwind Shelter House provides a popular place to hold group facility equipped with restrooms, a kitchenette, a large multi-purpose room, and restful porch areas. Call the park at 785-828-4933 for reservations. A swim beach and bath house are located in the park, as well as a laundry facility, picnic shelters, playgrounds, volleyball courts, horseshoe pits, a nine-hole disc golf course, and 2.5 miles of trails. Four modern cabins are available for reservation year-round. Nearby wildlife areas offer upland bird and waterfowl hunting. Bald eagles visit the lake in the winter and are often seen perching in shoreline trees or soaring above the lake. The Kansas Department of Wildlife and Parks administers Pomona State Park. The office located near the park entrance offers lake information, brochures, licenses and permits, and KDWP souvenirs. The state park is also served by a dedicated group of volunteers, the Friends of Pomona State Park, who offer support services and undertake projects that benefit the park and its visitors. The U.S. Army Corps of Engineers recreation areas at Pomona Lake include Carbolyn Park, with easy access from U.S. Highway 75 south of Topeka, Wolf Creek Park, Outlet Park, Michigan Valley Park, 110-Mile Park, Management Park, Dragoon Park and Cedar Park. The Pomona Lake dam was built in 1963 at a cost of $13,272, 000, with flood protection savings to date estimated at more than $210 million. Pomona Lake has a drainage basin of 322 square miles, and is operated in conjunction with other Army Corps projects for flood control in the Kansas, Missouri, and Mississippi river basins. Hunters can find a variety of game, including rabbit, dove, quail, deer, turkey, and waterfowl on Corps managed project lands and water. Hunting is permitted on approximately 4,500 acres of land surrounding the lake. Hunting is not permitted in park areas and several locations have some restrictions in effect. A variety of recreational opportunities and facilities are available at the Corps managed parks, including campsites, shade trees, electrical and water hookups, showers, picnic areas, playground equipment, and sanitary dump stations. Marina concessions are available in Michigan Valley Park, offering boating, fishing, and camping supplies and services. Boat ramps are available at all parks. A swimming beach is at Michigan Valley Park. In addition, accessible fishing docks, and nature trails all present great opportunities for a fun day at Pomona Lake, along with boating, fishing, hunting, swimming, hiking, biking, horseback riding, and disk golf. Pomona Lake was completed in 1963, with its dedication in 1964 and impoundment in 1965. All of the amenities needed for an enjoyable weekend or week on the lake are available at Pomona Lake’s parks or nearby businesses. Carbolyn Park, with easy access from U.S. 75, has 29 sites (26 electric and 3 primitive). It has a boat ramp, dump station, shower houses and playground. All sites are on a first come first serve basis, honor vault and gate attendant on location; open May through September. Outlet Park campground is open year round, with a reduced camping rate in the fall and winter months. Below the dam on the south side of the lake, the park offers 36 electric and water sites. The campground includes a shower house, dump station, playground, and reservable picnic shelters. All sites and shelters can be reserved April 1-Oct. 31; with winter camping Nov. 1-March 31. Michigan Valley Park is the largest of the Corps’ campgrounds at Pomona Lake, with 76 campsites, 52 of which have utilities. The park is the home of one of two marinas on Pomona Lake. Wolf Creek Park is west of Pomona Dam Road on the north side of the lake, and has 44 electric, and 43 primitive sites, shower house, group camp, playground, and a dump station. All sites are can be reserved except for B-loop, which is open on a first-come first-serve basis. The Corps also offers two free campgrounds on the north side of the lake, 110-Mile Park and Cedar Park. 110-Mile Park is a free campground open all year. It offers 25 campsites, with access to a concrete based boat ramp, courtesy dock, and 2 water hydrants. The park also serves as trailhead for the Witch’s Broom Nature Trail, a short walking trail, averaging about 20 minutes to walk; and the Blackhawk trail, which is approximately 33 miles long, and used by horses, bikers, and walkers. Reservable sites are not available in this park, although the horse camp may be reserved through the project office, call 785-453-2201 for details. Cedar Park also offers year round free camping, with eight primitive campsites and access to a rock base boat ramp. The park is located on the north side of the lake. Reservable sites are not available. The Corps of Engineers visitor information center is located at the southwest end of the dam at the administration building and is open 7:30 a.m.-4 pm Monday through Friday. It houses exhibits and displays which describe the history, flora, and fauna of the area, as well as Corps of Engineers information, brochures, trail guides, calendar of events and other lake information. Licenses and permits are also available. For more information or reservations, contact: U.S. Army Corps of Engineers, Pomona Project, 5260 Pomona Dam Road, Vassar, KS 66543, 785-453-2201 or visit online at: http://www.nwk.usace.army.mil/Locations/DistrictLakes/PomonaLake.aspx. Reservations can also be made by calling the NRRS Reservation Center toll-free at 877-444-6777, or online at www.recreation.gov. 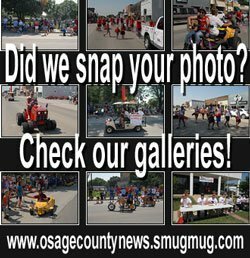 From Lyndon, Kan., also known as Osage County’s Gateway to the Lakes, go two miles north on U.S. 75/K-31 to state Highway 268, then 4.5 miles east to state Highway 368; then north 1.2 miles to Pomona State Park. 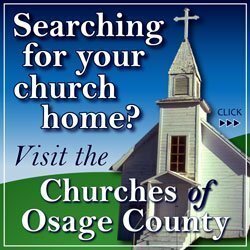 From Osage City, Kan., go east on state Highway 31 and K-268 11.5 miles to state Highway 368; then north 1.2 miles to state park. From Topeka, go 24 miles south on U.S. 75, 4.5 miles east on K-268 to 368, then north to park. From Ottawa, go 18 miles west on K-268 to K-368, then north to park. Information thanks to U.S. Army Corps of Engineers, Pomona Project; Kansas Department of Wildlife, Parks and Tourism, Pomona State Park; Friends of Pomona State Park; County of Osage County, Osage County Economic Development; National Weather Service Topeka. 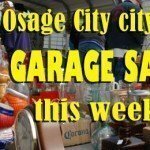 The information was originally published as an Osage County News special section here.